Ken Read and the team on PUMA Ocean Racing powered by BERG are flying into the last 100 miles to the Miami finish line at average speeds of almost 20 knots, with CAMPER with Emirates Team New Zealand (Chris Nicholson/AUS) in their rear view mirror, 18.10 nm behind. But it has been a tortuous night and Ken Read and his men came perilously close to losing the lead. As PUMA and CAMPER drifted towards the turning point at Eleuthera on Tuesday evening, the PUMA crew prepared for the worst, as they became becalmed close to the beach, sitting dead in the water. 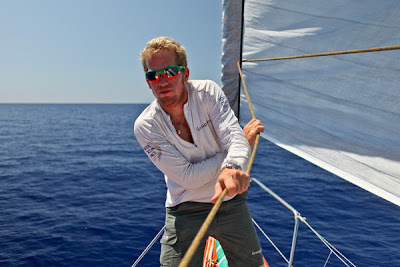 After a quick gybe and a change to a different sail, the team tried their chances further offshore, but again ran out of wind as CAMPER appeared on the horizon. “At this point we’re watching them sail down our line in utter amazement. We’re drifting in complete glass-off conditions. 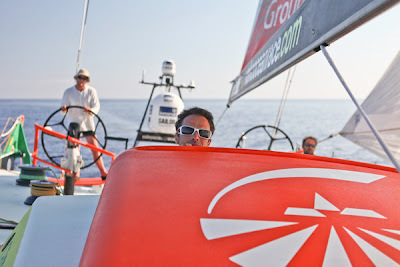 There is not a ripple on the water and all eyes are on the advancing red sails,” wrote PUMA’s Media Crew Member (MCM) Amory Ross. Then, as the PUMA crew sat drifting helplessly, CAMPER too ran out of wind. When the sun set, the wind returned and although CAMPER were now too close for comfort, PUMA had held on to the lead. The leading pair clawed their way around the Eleuthera Light just an hour apart at 0210 and 0310 GMT this morning, and PUMA is now stretching away towards a finish later today. For CAMPER with Emirates Team New Zealand, the finish can’t come quickly enough, having spent 70 of the last 88 days on board due to their pit stop in Chile to repair the boat during Leg 5 and their subsequent late arrival into Itajaí in Brazil. Meanwhile, the fight for the third podium place continues between Groupama (Franck Cammas/FRA) and Telefónica (Iker Martínez/ESP). 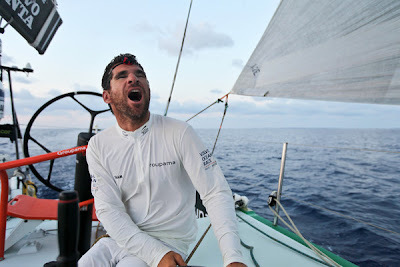 After choosing different tactics to pass Cat Island on Tuesday, they have reconnected and Groupama still leads Telefónica on the approach to Eleuthera Light, but only by eight miles. They are both over 100 nm behind PUMA. Abu Dhabi Ocean Racing (Ian Walker/GBR) are watching the action from the sidelines over 160 nm astern. “The pressure should build the longer we are out here, so perhaps we can come flying up from behind to make it a tight finish,” said MCM Nick Dana wistfully. As PUMA and CAMPER count down the final hours of the 4,800 nm Leg 6 from Itajaí in Brazil to Miami, Ken Read and his men will attempt to apply the basketball adage of keeping themselves between their opponent [CAMPER] and the hoop. “Sure sounds easy, but when you can’t see your opponent anymore it is like playing basketball in the pitch black and trying to stay with your man,” Read said today. 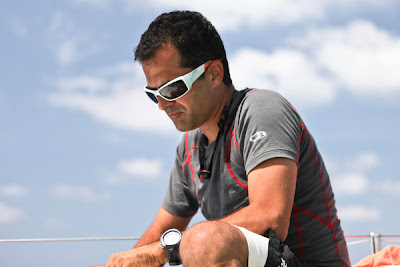 The leading boat is expected to arrive in Miami around 1600 GMT today.